Studying can be stressful (especially when your career’s future depends on it!) and studying for Google’s Analytics IQ Exam – a 90 minute, 70-question online test – is no exception. Thankfully, Google’s Analytics Academy is there with lots of lessons to teach you everything you need to learn. Remembering all those Analytics lessons when test time rolls around is another matter. I (Lindsey) studied all of their content before taking the exam and was still stumped by a few questions. Luckily for you I took screen caps of all the questions and compiled them into a the handy dandy study guide below. Study up & send us your praise & thanks on Twitter if it helped! 1. Which of the following types of data can be collected and reported in the Site Speed reports? e. all of these are tracked by the Site Speed reports. 2. Which of the following metrics would be most useful in measuring how many conversations were initiated by Paid Search? 4. Your ecommerce site sells colorful wrist watches that visitors can customize using a tool online. Which of the following represent a micro conversion for your site? 5. Which of the following metrics would most strongly suggest a poorly performing landing page? 6. Which of the following could be measured by defining a goal in Google Analytics? 7. Which of the following would you use to set-up a custom alert? 8. In which of the following circumstances would you want to increase the default session timeout length in Google Analytics? a. The average length of videos on your site is 35 minutes. b. You need to start collecting real-time data. c. The default session timeout length is set dynamically by Google Analytics and you cannot change it. d. Users typically spend less than 2 minutes on each page of your site. 9. Which of the following are examples of Sources? d. all of these are possible sources. 11. You need to immediately find out whether people are viewing the new content that you just added today. Which of the following would be most useful? 14. Which of the following AdWords reports would you use to investigate when you should modify your bidding during certain hours of the day to optimize conversions? 15. You want to see conversion rates for Windows visits coming from London. Which of the following dimensions would you need to select? 16. A visitor comes to your site but stops looking at pages and generating events. Which of the following will occur by default? 17. Setting up goals allows you to see _________. 18. It’s important to have a clear measurement strategy to guide your implementation strategy and your data analysis. Which of the following business objectives would be most relevant for content publishers? 19. You publish articles by many different authors on your site. You want to create a report that shows the total number of pageviews for each author. Which of the following features will allow you to add author information to Google Analytics? 20. You should add Analytics tracking code to your site ________. 21. Which of the following would most quickly allow you to determine whether the Google Analytics code snippet is working on a specific website page? 22. Which campaign tracking variables are required in order to ensure accurate data shows for your campaigns in the “All Traffic” report? 23. Your Multi-Channel Funnel reports have no data. What is the most likely reason? 24. Which of the following would you use to show two date ranges on the same graph? 25. Your web property is “www.example.com” You set up a URL goal of “/thankyou” and a Match Type of “Begins with”. Which of the following URLs will count as goals? 26. Which of the following would prevent URL destination goal conversions from being recorded? 27. Your business objective is to maximize the number of sales through your website. Which of the following metrics would most directly help you measure performance against this objective? 29. You want to be notified whenever weekly revenue for your ‘Spring Sale’ campaign increases, or decreases by 10%. Which of the following would be most useful? 30. Which of the following are possible uses of filters? 31. Specifying a goal value allows Google Analytics to calculate _____. 32. Which of the following are dimensions? 33. What is the first step of analytics planning? 34. Which of the following reporting dimensions would be useful to reference if you were rebuilding a website to improve accessibility? 35. Which of the following are valid scopes for dimensions? 36. Which are the four main parts of the Google Analytics platform? 37. Which of the following metrics shows the number of times your ad were displayed? 38. Which of the following questions can be answered using the goal flow report? a. Are there any steps in my conversion process that don’t perform well on mobile devices compared to desktop devices? b. All of these can be answered using the goal flow report. c. Do visitors usually start my conversion process from the first step or somewhere in the middle? d. Is there a place in my funnel where traffic loops back to the beginning of the conversion process to start over? e. Are there a lot of unexpected exits from a step in the middle of my conversion funnel? 39. Which of the following reports allows you to identify the terms visitors use to conduct searches within your site? 40. Which of the following are true about segmentation? a. Segmentation does not work on historical data. b. Segmentation should generally not be sued without Real-Time reporting. c. Segmentation is a technique that should only be used by experienced analysts. e. Segmentation allows you to isolate and analyze subsets of your data. 41. Digital analytics is ________________________________. 42. Which of the following represents a macro-conversion for an ecommerce site? 43. Why is it important that you maintain one unfiltered view when using filters with your Analytics account? 44. For each user who comes to your site, Google Analytics automatically captures which of the following Traffic Source dimensions? 45. Which of the following would be most useful in measuring how many days passed between the first visit to a site and the eventual conversion? 46. You want to evaluate the landing pages you are using for AdWords ads. Which of the following dimensions would be most useful? 48. Which of the following would be the most useful for optimizing landing pages? 49. You want to see the percentage in which a specific button was clicked. Which of the following would be the most useful? 50. What is the purpose of the URL builder? 51. Which of the following are possible uses of views within a single Google Analytics account? 52. Which of the following techniques would you use to exclude rows with fewer than 10 visits from a report table? 53. Which of the following would you use to send data from a web connected point-of-sale system to Google Analytics? 54. Which of the following attribution models would be useful for evaluating ads and campaigns that are designed to create initial awareness about a brand? 55. Which of the following Channels is part of the Default Channel Grouping? 56. Which of the following Behavior metrics shows the number of sessions that included a view of a page? 57. Which of the following are measures of traffic volume? 58. When configuring a goal, why is it useful to assign a goal value? 59. True or False: The order in which filters appear in your view settings matters. a. True. Filters are executed in the order in which they appear. b. False. Filters are not necessarily executed in the order in which they appear. 60. You’ve noticed that many users visit your site several times before converting and you want to understand in more detail how they arrive at your site. Which of the following metrics would be most helpful in showing you whether a keyword is part of a conversion path? 61. What is the hierarchy of the Google Analytics data model? 63. You want to know whether button X is clicked more often than button Y. Which of the following would be most useful? 64. If a paid keyword has an Assisted/Last Click or Direct Conversions value of .5, which of the following is true? 65. 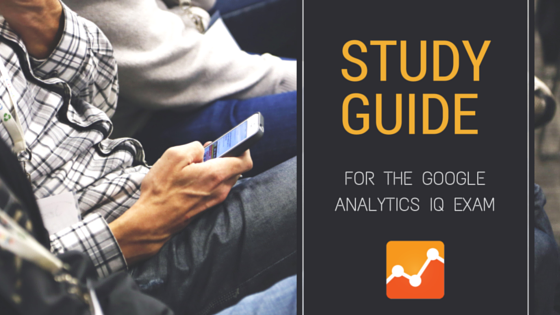 Which of the following technologies or features can be used to add data to Google Analytics? 66. Which of the following are advantages of implementing Google Tag Manager? 67. Which of the following is not a default Medium in Google Analytics?